Tippett’s string quartets fall into early and late phases: there are no middle period quartets, more’s the pity. He said he was drawn to the quartet medium on coming to London in 1923, where he remembered particularly the Busch and Léner Quartets. He listened to the Léner set of the Beethoven quartets on 78s so often that he came to know where the side-turns were and had to stop listening. Beethoven remained the strongest influence on his quartet writing. He wrote and rejected at least two quartets before his official No. 1. The Quartet No. 1 was first performed in 1935 but Tippett was dissatisfied with the first two movements. He discarded them and later – after writing No. 2 – replaced them with a single movement. The published version begins with a strenuous and angular opening, though with occasional lyrical relief and two poignant passages for solo cello. You can hear his intense engagement with Beethoven. The slow movement is an oasis of tranquillity which harkens back to the Elizabethan madrigals which Tippett also studied closely. The finale is a vigorous fugue which is so rhythmically adventurous that it was called unplayable at first – the fate of many a fine work which later became accepted into the repertory. In No. 2 Tippett changed the balance of the four movements, placing the passionate Sonata Allegro as the last movement. The opening movement features additive rhythm, that is with irregularly distributed accents, as opposed to divisive rhythm which uses metrical regularity. This perhaps shows some influence from Stravinsky’s neo-classical works for strings, such as Apollo. The second movement is a highly chromatic fugue based on a theme Tippett first devised some years earlier. There follows a Presto scherzo, again featuring additive rhythm. The finale has dancing rhythms which nevertheless carry a heavier chromatic burden which glances back to the second movement. No. 3 is the biggest of these three and indeed is the longest Tippett wrote. By this time he had heard the Bartók quartets and he acknowledged a possible influence in the fourth movement, which does indeed, in its opening, suggest the night music of Bartók. The five movement structure might also reflect an influence. There is no sonata-form movement: the design is three fastish fugues separated by two slower movements. These fugues are all very different: that of the opening movement has a subject reminiscent of that in the Hammerklavier fugue; that of the middle movement is brief and fierce; while that of the finale is in a gentle triple time. Although No. 2 is usually considered the finest of the early three – the Amadeus took it up, for example – I like No. 3 best of these. No. 4 did not follow until thirty years later. By then the Lindsay String Quartet, later known as "The Lindsays", had taken up these three works. They were coached by Tippett and then recorded them for L’Oiseau Lyre in 1975. They went on to premiere the last two. No. 4 is generally considered a tough nut, but that is only true of the overall structure, which is indeed difficult to follow. The texture from point to point is as captivating as ever and even more varied. Perhaps there is a slight sense of Tippett being by now much more used to orchestral writing. The work is nominally in one movement, a form Tippett was experimenting with at the time – other examples were the Fourth Symphony and the Triple Concerto. However, it does divide into four sections, though played continuously. The ideas are even more vivid than before but the abrupt changes of mood and texture can be disconcerting. Tippett’s last quartet was written when he was eighty-six. It was his penultimate work, followed only by The Rose Lake. This is also mercurial with frequent changes of mood, but it is much more lyrical than No. 4 – indeed at times one could almost think that Tippett had, after all, written a quartet during the time of The Midsummer Marriage and the Piano Concerto. Tippett was a real quartet composer with a feeling for the medium. These works are all rewarding and do not suffer from the same failings as some of his later works in other genres. 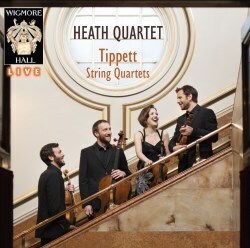 The Heath Quartet bring to them splendid energy and commitment. These are live recordings, with a few momentary imprecisions but also with the sense of risk that comes from live performance. They are well recorded in the lovely acoustic of the Wigmore Hall. Applause has been left in. The sleeve-note, in English only, is helpful. Of the competition, the Kreutzer quartet set on Chandos has disappeared and the Tippett Quartet on Naxos I have not heard (review review). The Lindsays went on to record the two they premiered and ASV licensed the first three and issued them all as a set in 1996. These have their characteristic fire and also their occasional fallible intonation. Given that they worked closely with the composer their performances will always be a reference for these works. The Lindsays’ sleeve-note, with an introduction by Tippett himself and an article Meirion Bowen, is also valuable. This set is currently only available as a download but Presto may well reissue the discs as part of their ASV licensing series. Meanwhile, if you want a recent set played by an ensemble which accepts these works on their own terms as part of the repertory the Heath Quartet will do very well.